Jessying - Malaysia Beauty Blog - Skin Care reviews, Make Up reviews and latest beauty news in town! 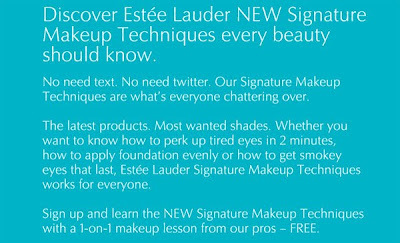 : Try Estee Lauder New Signature Makeup Technique for FREE! 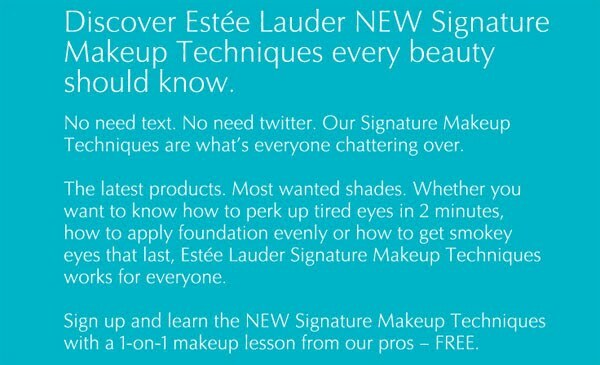 Try Estee Lauder New Signature Makeup Technique for FREE! Received this invitation via email from Estee Lauder Malaysia! This is a not something new as I had my mine back in February, except this one is kinda of roadshow/promotion to show us their latest Estee Lauder New Signature Makeup Technique. Of course I will recommended Parkson KLCC to all of you after having good time there, plus the Counter Manager Ms Marlia threw in some samples for me to try which is always a good thing . And after trying I do like their Estee Lauder Double Wear Foundation - 02 because my face was so smooth after application and coverage is medium and their Nutritious Night Creme (a full jar) does moisturise my face after hours sleeping in aircon, And when I woke up my face don't feel like drying out. Argh.. have so much things to buy nowww.. but I better save for my Hong Kong trip this end of month ! And by the way for those off you who have not try any of their signature service ( 7 types in total) , head down to any of these location above. Note : By appointment only.